Federal Ministry of Research provides 7 million euros for cooperative research work at CERN. ATLAS experiment and development of scintillator-based particle detectors as one of Mainz's main tasks in the coming years. Physicists from Johannes Gutenberg University Mainz (JGU) are involved in numerous projects of the international large-scale research institution CERN in Geneva. The Federal Ministry of Education and Research (BMBF) will continue to financially support this work in the coming years. For the three-year funding period until mid-2021, the BMBF provides nearly 7 million euros. "Projects at major research institutions are usually accompanied by a long-term commitment. “We therefore thank the Federal Ministry of Research for its continued support of these tasks with long-term, substantial funding,” says Prof. Dr. med. Georg Krausch, President of Johannes Gutenberg University Mainz. 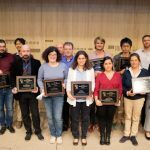 "The grants are also an award for our physicists, who make important contributions to the impressive research at CERN in many areas. We are also pleased that the achievements of the Mainz's physicists have been recently rewarded with the approval of the Cluster of Excellence PRISMA+," says the JGU President. The BMBF funds will be particularly used for Mainz's participation in cooperation projects such as the ATLAS experiment or the NA62 experiment. One focus of the group Experimental Particle and Astroparticle Physics (ETAP) is the research on the Large Hadron Collider (LHC), the largest particle accelerator in the world, which has been in operation at CERN since 2008. "The Mainz group has taken a great deal of responsibility for the ATLAS experiment at the LHC," explains Prof. Dr. Volker Büscher from ETAP. Prof. Büscher is spokesperson of ATLAS Germany since July 2018, in which the 17 institutions working on the experiment are organised. ATLAS discovered the Higgs boson in 2012 together with another LHC experiment. An important task of the ATLAS experts from Mainz is to analyze the data collected and recorded when the particles collide - more than 1 gigabyte per second. For this purpose, the Mainz supercomputer MOGON II, one of the fastest high-performance computers in the world, is available at the JGU. In addition, the physicists at Mainz University contribute to the upgrade of the ATLAS detector. They can rely on the infrastructure built up by the PRISMA Cluster of Excellence in Mainz, including the PRISMA Detector Laboratory. By granting the follow-up application for PRISMA+, this support will be secured in the future. Looking to the future, the ETAP Group is developing novel particle detectors with a wide range of potential applications. In the BMBF joint project for research and development on scintillator-based detectors, Prof. Dr. Lucia Masetti, also a physicist of the University of Mainz, is the spokesperson for the joint project. "Scintillator-based particle detectors are ideal for a wide range of applications, the challenges of which we now address together as a community," says the scientist. "Other activities we are particularly involved in, and funded by the BMBF, include the measurement of extremely rare kaon decays with the NA62 experiment, the search for axion-like particles, and machine learning," adds Büscher. The scientist notes that the LHC accelerator is in a long shutdown for the next two years since early December to carry out major upgrade work. "There is a lot to do for us during this time," says Prof. Büscher. "Then, with the LHC restarting with increased luminosity, we'll go deeper into exploring the smallest particles that make up our matter." Large-scale experiments in fundamental research require more and more computing and storage resources. In order to gain further scientific insight in the future, physicists from several research institutions have now joined forces in a project funded by the Federal Ministry of Education and Research (BMBF) to develop innovative digital processing methods. In the context of the framework programme "Erforschung von Universum und Materie – ErUM", the Federal Ministry of Education and Research (BMBF) is funding this network with the name "Innovative Digital Technologies for Research on Universe and Matter" as a pilot project with a total of 3.6 million euros over the next three years. Researchers of the ETAP group are participating in this network together with other researchers from the groups of the Universities of Aachen, Erlangen-Nuremberg, Frankfurt am Main, Freiburg, Hamburg, Munich, Wuppertal and the Karlsruhe Institute of Technology as well as the associated partners DESY (Deutsches Elektronen-Synchrotron), CERN, Forschungszentrum Jülich, Grid Computing Centre Karlsruhe (GridKa), GSI Helmholtzzentrum für Schwerionenforschung and the Universities of Bonn, Göttingen and Münster. Prof. Thomas Kuhr from the LMU coordinates the network. The participating researchers contribute their diverse experience and knowledge in the fields of distributed computing infrastructures and algorithm development to the project. Within the next three years, the joined project will develop and test new computing systems. One promising approach is the use of virtualization technologies to tap previously inaccessible resources. The scientists are also thinking about the use of new processor architectures, which are used, for example, in graphics cards and promise better energy efficiency (Green IT). The researchers see an important pillar in the development of improved algorithms and the use of artificial intelligence (AI) for Big Data analyses. Innovative methods of "machine learning" will play an important role here. "The huge amounts of data are a great challenge for us. Innovative digital methods will be indispensable in the future if fundamental research is to advance decisively," said network coordinator Prof. Thomas Kuhr. However, it is not only physical research that faces the digital challenge. "Sooner or later, other scientific disciplines will also need powerful computing environments and will benefit from the new competences," Kuhr is certain. The joint project offers the participating young scientists an excellent opportunity to acquire comprehensive knowledge in new computing technologies. This means they are well prepared to fill leading positions in science or business in order to drive digital change forward. The contribution of the ETAP group within this network is the replacement of existing algorithms for the real time detection and reconstruction of physics objects by deep neural networks. The group is targeting a processing rate of up to 40 MHz and a maximum response time of less than a millionth of a second. This will be sufficient to cover a large range of applications within the network. Field Programmable Gate Arrays (FPGAs) are the ideal choice. The challenge is to optimally adapt the neural networks to the architecture of FPGAs, and the first trigger stage of the ATLAS experiment provides an ideal test environment for this. Two members of the ETAP ATLAS group received the ATLAS outstanding achievement award for the work on the ATLAS Level-1 Topo trigger. They have been awarded the price together with Olga Igonkina, Murrough Landon and Imma Riu. PRISMA + is the follow-up application for the Cluster of Excellence "Precision Physics, Fundamental Interactions, and Structure of Matter" (PRISMA), which has been successful in the previous Excellence Initiative and has been funded since 2012. Today the German Research Funding Agceny (DGF) has announce the selection of the projects that will be funded under the Excellence Initiative. An international committee of experts and the science ministers of the federal and state goverments has selected 57 out of 88 submitted projects. The PRISMA+ project for precision physics, fundamental interactions and structure of matter which was submitted by the University of Mainz was among the selected projects. The total amount of the requested funding is expected to be 64 million euro over the next seven years. It was a sensation in 2012: Scientists at CERN have discovered the Higgs Boson that have been postulated for decades. Now another prediction has been confirmed: The Higgs Boson decays into two bottom quarks. 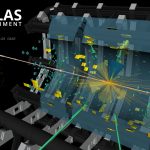 The two independent research teams of the ATLAS and CMS experiments at LHC have succeeded in detecting Higgs decay into two bottom quarks. Even before the concrete proof, theoreticians had long predicted the decay in bottom quarks. Although it is a common pattern of decay - it occurs in 58 percent of cases - the teams have only now succeeded to observe this decay mode. Since this reaction can not be observed directly, the researchers instead reconstructed the decay products of particle collisions in the LHC. For this they use high-precision detection devices the size of an apartment building. The challenge here: The pattern occurring resembles other, much more frequent decays, in which the Higgs Boson is not involved. Multimessenger astrophysics has been crowned with success: a research team has for the first time located a cosmic source of high-energy neutrinos. 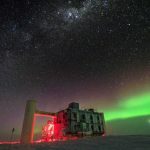 The trigger for the search was a single high-energy neutrino, which had been detected on 22 September 2017 in the ice of Antarctica by the neutrino telescope IceCube. Earth and space telescopes subsequently determined the origin of this elementary particle. It lies in a galaxy three billion light-years distant in the constellation Orion, in which a gigantic black hole naturally accelerates particles. Scientists from 16 astronomical observatories participated in the campaign worldwide. Among the researchers are also Prof. Dr. Sebastian Böser and Prof. Dr. Lutz Köpke from the Institute of Physics of Johannes Gutenberg University Mainz (JGU), which belongs since 1999 to the IceCube consortium. The results of this joint search were recently published in the journal Science. Results presented today, at the LHCP conference in Bologna, describe the observation of this so-called "ttH production" process. 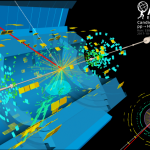 Results from the CMS collaboration, with a significance exceeding five standard deviations for the first time, have just been published in the journal Physical Review Letters; including more data from the ongoing LHC-run, the ATLAS collaboration just submitted new results for publication, with a larger significance. The findings of the two experiments are consistent with one another and with the Standard Model. They tell scientists more about the properties of the Higgs boson and give clues for where to look for new physics. On May 28th, Prof. Elena Aprile from Columbia University, spokeswoman for the XENON collaboration, and Prof. Manfred Lindner from the Max Planck Institute for Nuclear Physics in lectures at LNGS and CERN present the latest results of XENON1T, the world's largest and most sensitive detector for the direct search for dark matter in the form of WIMPs (weakly interacting massive particles). The extensive data set of 1 ton × year agrees with the expectation for the background, thus setting the strongest limit for spin-independent interaction of WIMPs with normal matter for a WIMP mass of more than 6 GeV / c². These results show that WIMPs - if they are indeed the dark matter particle - produce such a rare signal that even the largest and most sensitive detector built so far can not detect it. XENON1T continues to collect data until the larger version of the detector currently being prepared is ready for use, for which most components are already designed. With three times more xenon in the time-projection chamber and ten times lower background rate, XENONnT will launch a new phase of dark matter particle search beginning in 2019. 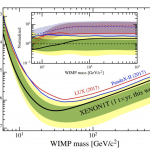 Prof. Dr. Uwe Oberlack from the Johannes Gutenberg University Mainz is one of the founding members of the XENON program on the search for dark matter. The Mainz working group is involved in the XENON experiments in both data analysis and simulations as well as detector technology. Mainz astroparticle physicists are responsible for the muon detector and are involved in the ReStoX xenon storage system and the inner detector. 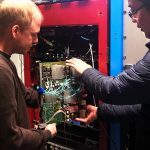 In order to make another leap in sensitivity in the next step with the XENONnT experiment, the group is working on the development of a subdetector for the detection of neutrons. The research is also part of the Cluster of Excellence PRISMA, which is funded by the "Exzellenzinitiative des Bundes und der Länder". Four young scientists from abroad will receive new research projects at Johannes Gutenberg University Mainz (JGU) with the support of the EU. One of them, Dr. Peter Berta is a member of our group and will conduct research in the field of Higgs boson physics. The funding is provided by individual EU research grants in the Marie Skłodowska-Curie program - a high honor for the beneficiaries. The EU supports the outstanding young researchers for a total of € 650,000 over a period of 24 months. With the discovery of the Higgs boson in the summer of 2012 at the CERN research center, the question of the mechanism that gives elementary particles a mass has been clarified. However, many new questions about the properties of the Higgs boson itself have surfaced. 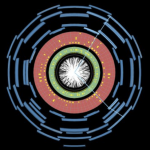 Dr. Peter Berta is working in the group of Prof. Dr. Lucia Masetti on the interaction between the Higgs boson and the top quark, which can be measured in proton-proton collisions at the Large Hadron Collider at CERN, with the ATLAS experiment. If the measurement deviates from the Standard Model of particle physics, it would indicate new phenomena that could answer many unanswered questions about the fundamental interactions. 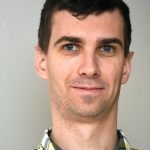 Peter Berta, born in Slovakia, completed his doctorate at the Charles-University in the Czech Republic and has been working with the ATLAS experiment since 2012. He has been working as a postdoctoral fellow at JGU since March 2017. On Saturday, 28 April 2018, the operators of the Large Hadron Collider (LHC) successfully injected 1200 bunches of protons into the machine and collided them. This formally marks the beginning of the LHC’s 2018 physics season. The start of the physics run comes a few days ahead of schedule, continuing the LHC’s impressive re-awakening since the end of its annual winter hibernation just over a month ago.